Former President Barack Obama made his grand re-entrance onto the public political stage again last week. His speech at the University of Illinois at Urbana-Champaign was designed to inspire Democratic voters to vote in the upcoming midterm elections. It was classic Obama: long on soaring rhetoric, short on truth. If Democrats think Obama is their ace in the hole to play against the Republicans’ Trump card, bring it. Obama's less-than-stellar record had begun to fade into the recesses of the public's memories. But now it's all fresh again -- and fair game. Of course, it was probably hard to be humble when pundits routinely compared him to God and rendered him beatifically with halos in photo after photo. Trump doesn’t have that problem. True, Trump had no political experience before running for president. But Obama had precious little. He was elected to the Illinois state Senate three times (the first was a special election) and announced his candidacy for U.S. Senate just one year into his second full four-year term. He served just over two years of his first six-year term in the U.S. Senate before announcing his candidacy for president of the United States. He had no executive experience in the public or private sector. Ambitious? Yes. Experienced? No. Obama is still lying. Last week, he denounced Republicans for causing “the politics of division, of resentment and paranoia” and said that the GOP’s definition of “civility” is “‘We will be polite as long as we get a hundred percent of what we want.’” Apparently, Obama wasn’t watching the clown show put on by Senate Democrats at Supreme Court nominee Brett Kavanaugh’s confirmation hearings. That would be Vladimir Putin. And how about the time Obama drew a “red line” for Syrian strongman Bashar Assad, warning him not to use chemical weapons? Assad thumbed his nose at the United States, using chemical weapons multiple times, whereupon President Obama did nothing. When American college student Otto Warmbier was arrested and imprisoned in North Korea in 2016, the Obama administration urged his family to remain quiet and patient. Nothing happened. President Trump was able to get Otto Warmbier released. (Tragically, Warmbier arrived home in such horrific physical condition that he died only days after being returned.) Trump also obtained the release of three additional prisoners -- Kim Dong-chul, Tony Kim and Kim Hak-song. Obama proclaimed this week that he never had the hostile relationship with the press that President Trump has. Even the press called him out on that whopper. 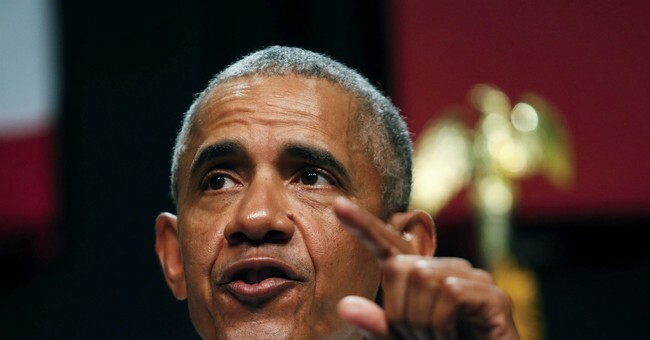 Obama’s administration was notoriously closed to press inquiry, spied on journalists, seized their records, denied Freedom of Information Act requests at unprecedented levels and prosecuted whistleblowers. And he was described as “going to war” against Fox News. Laughable. The economy is doing so well -- jobs up, unemployment down, wages rising, consumer confidence up -- that Obama is now trying to take credit for it. Sorry, Mr. Obama, but you didn’t build that. Trump versus Hillary Clinton was amusing. But Trump versus Obama is the Clash of the Titans. So, please, Mr. Obama, keep speaking. Every day. For the next two months. Because if the November 2018 elections become about Obama’s record, Republicans will sweep.